For the last five centuries, ever since Gutenberg’s printing press made book reading a popular pursuit, the linear, literary mind has been at the center of art, science, and society. As supple as it is subtle, it’s been the imaginative mind of the Renaissance, the rational mind of the Enlightenment, the inventive mind of the Industrial Revolution, even the subversive mind of Modernism. It may soon be yesterday’s mind. It’s an inspiring image, this picture of the modern mind arrayed in the glories of progress and possibility. As readers of my site, library ad infinitum, likely know by now, I’m suspicious of any pronouncements that begin with Gutenberg. To say that the printing press was an agent of change, or that moveable type inaugurated a series of transformations in world culture, is reasonable, if very preliminary; but to treat the goldsmith from Mainz as modernity’s master builder simply is wrong: wrong on the biography, wrong on the facts, wrong from the perspective of a theory of history. Gutenberg and his investors were trying to corner the market in Bibles—a market that already existed. Time made him its Person of the Millennium, but Gutenberg was no Leonardo, no Michelangelo, no Descartes. The fact that he wasn’t — that he was a man of no particular account in his own time — drives the subsequent story of his invention, moveable type, in interesting ways — ways too complex to boil down to the kind of simplistic formula Carr likes to proclaim. Moveable type is not what made book reading a popular pursuit. That it played a role is not in doubt — although it may just as easily be said that the increasing popularity of book-reading spurred transformations in the technology, spurring inventors to find ways to increase the output of the press. But Gutenberg’s invention, however epochal it appears in retrospect, is rightly seen not as an origin point but as a station along the way — an important one, a real Penn Station or Kings Cross, with lots of branch lines and spurs sprouting from its many platforms — but a station nonetheless. Here’s the most esoteric part, and the most vital. There is no unitary mind at work in history, neither a plan nor a Geist, no questing Spirit of Modernity or Truth or Righteousness. There’s a damaging irony at work in the model to which Carr seems to ascribe: for if the modern mind truly is the the direct descendant of Gutenberg’s invention, then so is the Internet. And like the host of cultural innovations that partook of the possibilities of the press — humanism, the Reformation, rationalism, the modern novel — critics fear its disruptive powers. In retrospect, we mistake those innovations for the charted course of history; to our counterparts in their respective eras, they looked like the Internet does to Carr: exciting but disruptive, soothing but dangerous, seductive but corrosive. What is the four-sided Mind of which Nick Carr speaks — this imaginative, rational, inventive, subversive angel striding through the ages, showering the generations with its beneficence? Who is this promethean shapeshifter, whom we’re now in our churlishness binding to some rock for the crows to feast on its innards? What Carr is describing isn’t a historical reality — it’s a god. And it does not exist. What troubles me most in the first chapter of The Shallows is the simplistic definition of reading Carr offers. 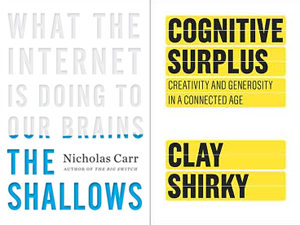 It may seem strange to call it simplistic, as the epithets that characterize reading at its best for Carr all derive from the matrix of “complex,” subtle,” and “rich.” But he writes as if these are all that reading has been (ever since Gutenberg, anyway), as if the kind of reading he ascribes to the web — quick and fitful, easily distracted — is a new and disruptive spirit. But dipping and skimming have been modes available to readers for ages. Carr makes one kind of reading — literary reading, in a word — into the only kind that matters. But these and other modes of reading have long coexisted, feeding one another, needing one another. By setting them in conflict, Carr produces a false dichotomy, pitting the kind of reading many of us find richest and most rewarding (draped with laurels and robes as it is) against the quicksilver mode (which, we must admit, is vital and necessary). In ecosystems like the Gulf of Mexico, the shallows are crucial. They’re the nurseries, where larval creatures feed and grow in relative safety, liminal zones where salt and sweet water mix, where light meets muck, where life learns to contend with extremes. The Internet, in this somewhat dubious metaphor, is no blowout — it’s a flourishing new zone in the ecosystem of reading and writing. And with the petrochemical horror in the Gulf growing daily, we’re learning that the shallows, too, need their champions. Battles, Matthew. "Reading isn’t just a monkish pursuit: Matthew Battles on “The Shallows”." Nieman Journalism Lab. Nieman Foundation for Journalism at Harvard, 29 Jun. 2010. Web. 18 Apr. 2019. Battles, Matthew. "Reading isn’t just a monkish pursuit: Matthew Battles on “The Shallows”." Nieman Journalism Lab. Last modified June 29, 2010. Accessed April 18, 2019. https://www.niemanlab.org/2010/06/reading-isnt-just-a-monkish-pursuit-matthew-battles-on-the-shallows/.